I was chatting on the phone with a friend on Friday and he asked me if I believed in fairy tales. 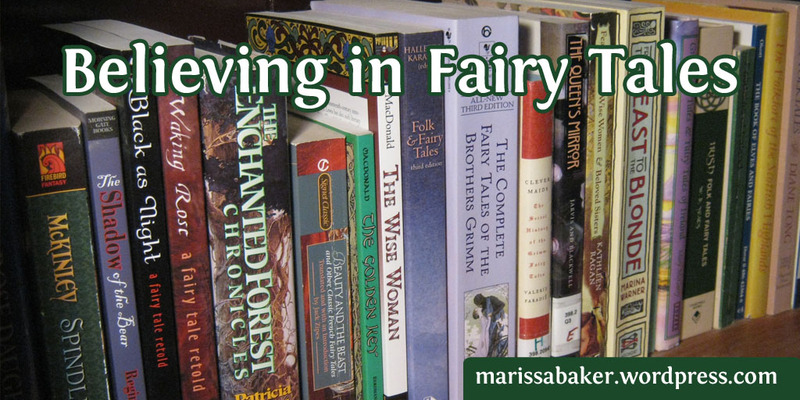 I deflected the question onto, “What do you mean by ‘believe in fairy tales’?” Because it really is a deeper, more complex question than it seems on the surface. Usually, people think of believing in fairy tales as romantic daydreams all day long and a “happily ever after” at the end of every story. But I’ve read fairy tales. In most of them, you go through hell several times over before getting to a happy ending (see the Handless Princess tales for one example). And sometimes there is no happy ending at all and they end with death or maiming or losing everything you love (such as when The Little Mermaid dissolves into sea foam). So I’m not sure what to answer when asked if I believe in fairy tales (though I did have a good laugh after our conversion, when I realized I’d been wearing a shirt that says “I believe in fairy tales”). However, I suppose the short version would be to simply answer “yes” to any version of the question. Do I believe in happily ever afters? yes, but only if 1) you work to make it happen and stay committed to falling in love with that person the rest of your life, or 2) if we’re talking about the Christian hope of spending eternity with God as Jesus’ bride. Do you believe life can be cruel and horrible before you get a happy ending? Certainly. In fact, I’d say it’s much more rare to get happiness without having some kind of trial first. And without the contrast of highs and lows, I doubt we could truly appreciate the good things. Do you believe happy endings aren’t guaranteed and life can feel senseless and hopeless? Yes. I’ve lost two friends close to my age to suicide, one to a car accident, and one to an illness. In my local church group, several families have lost young children or have kids and grandkids battling horrible illnesses. Sometimes there’s just no good explanation for why things turn out the way they do. All too often, people dismiss fairy tales as out-dated children’s tales that teach things irrelevant to the modern world. I’ve heard the heroines are too passive, the dark tales too dark, the happy tales too unrealistic, the messages outdated. But I would argue the complicated nature of fairy tales is the aspect most relevant today. Taken as a whole, fairy tales refuse to see life as easily explained. They present the strangeness, complexity, and downright cruelty of life in a stripped-down story form that refuses to be brushed aside. And many do earn their reputation for ending “happily ever after” because even after all the terrible things that happen they insist on hope. And that’s why I believe in fairy tales. I believe in the magic of storytelling, it’s power to hold a mirror up to our world, and our deep need for fantasy that illuminates reality. And I believe that in a world which refuses to make sense we need a hope that defies logic just as persistently. I share your sense of bafflement at the phrase “believe in” fairy tales. (By the way, let’s also point out there are very few fairies in these stories, even when there’s an infusion of “magic.”) I have deep respect for these stories, especially once any sugarcoating is removed. An awareness of Rapunzel’s pregnancy, for example, changes the perspective completely. The same goes with many of our Bible stories. Do we have to “believe in” them as a requirement for engaging them? Are we allowed to be outraged or questioning at what the characters do or the events that unfold? Do we have to accept them as factually correct, historically accurate, or scientifically grounded before we can enter into their drama or ethical challenges? I’ve often been puzzled at how we ended up describing them as “fairy tales.” There aren’t many I can think of with actual fairies in them. It’s interesting you bring up Bible stories. I do “believe in” them in the sense of being a Christian who thinks of the Bible as God’s inspired word, and I also like discussing them as stories. One of the most interesting college classes I took was about the English Bible as literature. We had some fascinating discussions from quite a variety of perspectives. And I think it should be possible to engage with them even without being a believer (though whenever we’re talking about religious stories, whether Christian or non-Christian I do think discussions should be respectful of the people who hold those beliefs). I loved this! Your thoughts on fairy tales echo many of my own sentiments. You know I was really disappointed with the movie “Frozen” because when I went to watch it, I had not seen any trailers for it (believe it or not!) and all I had heard was that it was some sort of adaptation of the “Snow Queen” which is one of my favorite stories. And then the story ended up being nothing like the “Snow Queen” and compared with the original fairy tale’s redemptive climax, “Frozen” kind of fell flat (i still thought it was cute and who can resist the music?) Nevertheless most of our modern retellings of fairy tales simply do not do the original stories justice. Another one that comes to mind is “Tangled”. It’s one of my favorite Disney movies, but compared with the tragedy of “Rapunzel” it simply is a little too child-friendly. I like to think of the original and the Disney versions as two completely separate things so I can enjoy both. But it is sad that there aren’t more film versions that are closer to the originals in addition to the Disney-fied versions.